Last week, leaders from cities, states, provinces and businesses across the globe gathered in San Francisco for the Global Climate Action Summit (GCAS), providing an opportunity for non-federal actors to showcase their commitment to implementing the Paris Agreement. During the course of the summit, leading governors, mayors, CEOs and local activists leveraged this opportunity to announce new commitments and to underscore the need for an all-hands-on-deck approach to tackling the climate crisis. The summit highlighted an important new message on the economics of addressing climate change: not only is it necessary to curb heat-trapping pollution, but building low-carbon economies also represents a tremendous opportunity to rapidly scale up the use of clean energy technologies. This message was powerfully delivered by The Global Commission on the Economy and Climate in its 2018 report to UN Secretary General António Guterres before the summit. 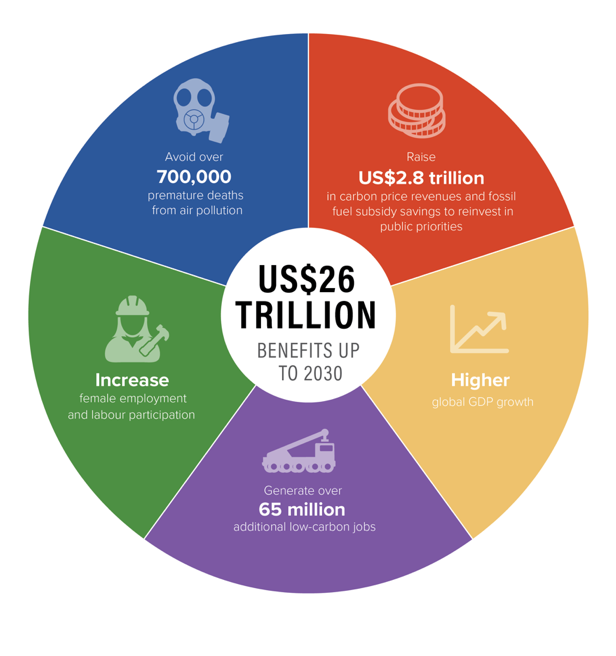 The report found that global climate action consistent with the Paris Agreement could yield a cumulative economic gain of $26 trillion through 2030 and avoid over 700,000 premature deaths per year. As Lord Nicholas Stern told summit delegates, this is the new growth story of the 21st century. While the current administration has turned its back on these opportunities, cities, states, businesses and universities representing over half the U.S. economy and population have stepped up to lead by declaring We Are Still In to show their continuing commitment to the Paris Agreement on climate change, despite the current U.S. administration’s stated intention to withdraw from the pact. The impact of these commitments is assessed in Fulfilling America’s Pledge, the new report introduced by former New York Mayor Michael Bloomberg and California Governor Jerry Brown at GCAS. 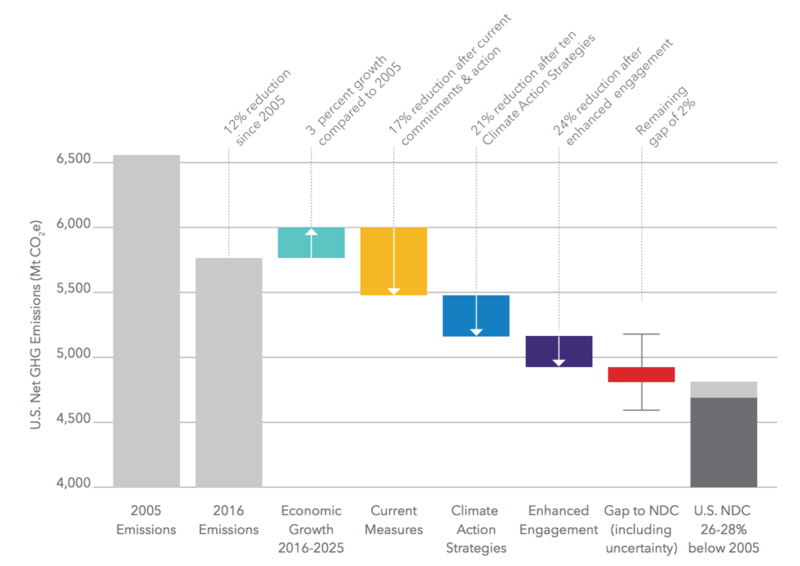 With analysis from WRI, University of Maryland, Rocky Mountain Institute and others, the report finds that implementing the commitments that states, cities and the private sector have already made, when combined with federal policies that are still in effect, would achieve about two-thirds of the U.S. Paris pledge to cut emissions of heat-trapping gases to 26 to 28 percent below 2005 levels by 2025. If non-federal actors scale up ambition and include more states, cities and companies, U.S. emissions could be cut by 24 percent or more by 2025, nearly meeting the Paris target. Living up to his leadership role as host of the summit, Brown signed landmark legislation mandating that California get 100 percent of its electricity from renewable and zero carbon sources by 2045. Brown also issued a new Executive Order establishing a statewide target of zero net emissions by 2045. This visionary target raises the bar for climate ambition and underscores the need to develop approaches to remove carbon dioxide from the atmosphere while cutting emissions as quickly as possible. The U.S. Climate Alliance announced plans to work together to reduce GHG emissions and enhance resilient carbon sequestration on natural and working lands. New York, Maryland, California and Connecticut announced new rules to begin phasing down superpolluting HFCs. Canada and Mexico accepted the Short-Lived Climate Pollutant Challenge and the Natural and Working Lands Challenge issued by the U.S. Climate Alliance. State treasurers of California, New Mexico and Rhode Island, along with a number of U.S. cities, joined Mexico City and funds from Australia and Luxembourg as the first signatories of the Green Bonds Pledge to account for climate risk in the design of capital-intensive projects. Minnesota, Connecticut and Hawaii joined Los Angeles in pledging to phase out the use of electricity from coal-fired power plants. Seventeen U.S. cities, including Houston, Pittsburgh and Salt Lake City, committed to developing aggressive climate action plans by 2020 and becoming emissions neutral by 2050. Cities4Forests, the new group of 45 cities pledging to conserve and restore forests near and far, counted 18 U.S. cities such as Little Rock, Detroit and Raleigh as inaugural members. Five U.S. cities pledged to procure solely zero-emissions buses by 2025. Eight cities committed that all city buildings will meet net-zero carbon standards by 2050. New York City pledged to invest $4 billion in climate solutions by 2021. Four-hundred-eighty-eight global companies have committed to setting Science-Based Targets, with major US companies including The Kraft Heinz Company and Salesforce recently stepping up to set GHG reduction targets in line with Paris Agreement goals. Twenty-one healthcare systems representing more than one million employees around the country joined the We Are Still In coalition and eight U.S. medical institutions committed to 100 percent renewable electricity. Many U.S. businesses, including Lyft, Salesforce and WeWork, declared their intent to harness emerging technologies like artificial intelligence and the internet of things to drive down greenhouse gas emissions. These announcements show important progress, but they are not enough. Everyone must continue ramping up ambition if we are going to limit warming to 1.5 or even 2 degrees Celsius (2.7 or 3.6 degrees F). Recognizing this, the Summit culminated in a Call to Global Climate Action urging governments to increase their ambition, develop strategies for reaching zero net emissions by mid-century, and empower climate action at the regional and local level. To spread the message throughout the United States, a cross-country New America Road Trip via electric car will deliver the call to action document to French President Emmanuel Macron at the UN General Assembly in New York, with stops along the way in Las Vegas, Boulder, St. Louis and Pittsburgh. Accelerating implementation of all the pledges made at GCAS will require broad and deep citizen engagement to track progress and keep elected officials and corporate executives on course. Fortunately, 29 philanthropies committed unprecedented additional funding for such efforts. For its part, WRI will continue to convey the scientific imperative for action, analyze policy options, crunch the numbers and engage businesses leaders and government officials across the political spectrum.